A roundup of recent riots, mostly by migrant workers, across China. 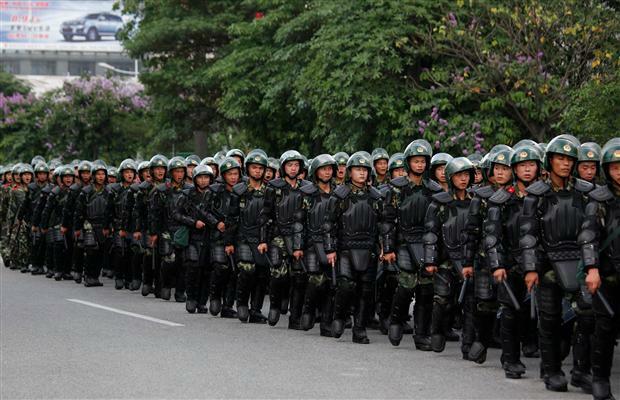 The conflicts began Friday June 13th after a fracas between security officers & a pregnant street vendor in Xintang, Guangdong province. Most protesters were migrant workers like the vendor. Last week 100s of migrant workers clashed with police in Chaozhou, also in Guangdong, following a dispute over unpaid wages. In Lichuan, Hubei, as many as 2,000 protesters attacked government headquarters June 10th after a local politician who’d complained about official corruption died in police custody. Inner Mongolia recently saw its biggest street protests for 20 years, over the killing of a Mongolian herder trying to halt coal trucks trespassing on grasslands. Police quell migrant riots in ChinaZENGCHENG, China (Reuters) – Riot police poured into a southern Chinese factory town crowded with migrant workers Monday, a day after militia fired tear gas to quell rioting over the abuse of a pregnant street hawker who became a symbol of simmering grassroots discontent. Hong Kong television showed crowds of workers and stall holders, many from the rural southwestern province of Sichuan running through the streets of Zengcheng in Guangdong province over the weekend. The rioters smashed windows, set fire to government buildings and overturned police vehicles, bringing to a climax anger over security guards who had set upon the hawker, Wang Lianmei, Friday. Footage showed riot police firing tear gas and deploying armoured vehicles to disperse the crowds, and handcuffing protesters. By Monday evening the unrest had subsided. But hundreds of riot police guarded the streets, and continued arriving by the busload, while wary workers watched on street corners. Though protests have become relatively common over anything from corruption to abuse of power, the ruling Communist Party is sensitive to any possible threat to its hold on power in the wake of the protests that have swept the Arab world. Guangdong is also a pillar of China’s export industries, and persistent unrest there could unnerve buyers and investors. Witnesses said more than 1,000 protesters had besieged at least one government office in Zengcheng. News reports said the incident was sparked Friday night when security personnel in nearby Dadun village pushed pregnant hawker Wang, 20, to the ground while trying to clear her from the streets. “The case was just an ordinary clash between street vendors and local public security people, but was used by a handful of people who wanted to cause trouble,” Zengcheng Mayor Ye Niuping was quoted as saying by the China Daily newspaper. Other clashes have erupted in southern China in recent weeks, including in Chaozhou, where hundreds of migrant workers demanding payment of their wages at a ceramics factory attacked government buildings and set vehicles ablaze. Last week, protests erupted in central China at the death under interrogation of an official. Despite pervasive censorship and government controls, word of protests, along with often dramatic pictures, spreads fast in China on mobile telephones and the Internet, especially on popular microblogging sites. In 2007, China had over 80,000 “mass incidents,” up from over 60,000 in 2006, according to the Chinese Academy of Social Sciences. Many involved no more than dozens protesting against local officials over complaints about corruption, abuse of power, pollution or poor wages. No authoritative estimates of the number of protests, riots and mass petitions since then have been released. Guangdong’s Communist Party boss, Wang Yang, is one of the ambitious provincial leaders who may win a place in China’s next central leadership, after President Hu Jintao and Premier Wen Jiabao retire from power from late next year. In past months, Wang has sought to cast himself as a moderate leader willing to heed ordinary citizens’ gripes, and has said his priority is improving the public sense of wellbeing — a gentler message than the hardline one that domestic security officials have pushed. Also in April, the Communist Party committee of Guangdong heard a lecture from Sun Liping, a sociologist from Tsinghua University in Beijing who has bluntly warned that corruption, inequality and divisions threaten to “rupture” Chinese society. A wave of violent unrest in urban areas of China over the past three weeks is testing the Communist Party’s efforts to maintain control over an increasingly complex and fractious society, forcing it to repeatedly deploy its massive security forces to contain public anger over economic and political grievances. Anti-government protests have become increasingly common in China in recent years, according to the government’s own figures, but they have been mainly confined to rural areas, often where farmers have been thrown off their land by property developers and local officials. The latest unrest, by contrast, involves violent protests from individuals and large crowds in China’s cities, where public anger is growing over issues including corruption and police abuses. What happens when China’s growth slows to 4%? For years, investors in Chinese companies have used the reputations of outside auditors, institutional investors and global investment banks as a proxy for reliable financial reporting. Maybe the disclosed data wasn’t always easily understood, transparent or accurate but if a Big Four international accounting firm like Deloitte Touche Tohmatsu signed off on the audit, a big institutional investor like JPMorgan Chase (JPM, news) owned a couple of million shares and an investment bank like Goldman Sachs Group (GS, news) had underwritten the company’s initial public offering, the financials had to be OK, right? That’s what’s so depressing, disturbing and disorienting about the fraud recently uncovered at Longtop Financial Technologies (LFT). The company’s books were audited by Deloitte, and Longtop still managed to lie about the $332 million in cash it claimed on its balance sheet. This was no penny stock that duped only unsophisticated individual investors. JPMorgan Chase owned almost 2 million shares that were worth $62 million as of March 31. FMR, which owns the Fidelity mutual fund family, had $261 million invested. Maverick Capital, a hedge fund with $20 billion under management, owned $177 million of Longtop Financial Technologies shares. The lead underwriters on Longtop’s 2007 IPO had been Goldman Sachs and Deutsche Bank. In 2009, Morgan Stanley was the lead manager of a sale of more shares. In other words, Longtop Financial Technologies isn’t a bad apple in a barrel of otherwise sound fruit. Instead, it’s symptomatic of a big problem that has tainted an entire sector. And because China is too big an economy and too promising a stock market to simply ignore, investors need to figure out how to deal with the problem. When things are booming, everyone is willing to look away. That’s what happened with the US housing bubble as well. Greenspan then Bernanke were both in denial, as was the NAR, real estate flippers, and everyone who stood to profit from the bubble on the long side. As long as the stock market, the job market, and housing prices hold up, China may be able to contain social unrest. ” When China’s credit bubble implodes, things will likely be anything but “contained”. On Tuesday, scores of Chinese business leaders, financiers, entrepreneurs and academics piled into a hotel in Athens for a “premier conference” aimed at increasing Chinese investment in Greece, where foreign direct investment remains among the lowest in Europe. After taking over day-to-day running of Piraeus, the biggest harbour in the Med, China has signalled it wants to buy the loss-making railway company OSE, as well as other infrastructure projects. Chinese officials admit they see Greece as the perfect gateway to markets in the Balkans and Europe beyond. The US, must necessarily “ride the tiger”….of China’s rise, of China’s holdings of $2 trillion in dollar reserves and Fanny Mae and Freddie Mac bonds, of China’s growing involvement in Africa and Latin America for natural resources, hoping to either cement China’s involvement an international status quo that will continue to subsidize America’s relentless economic decline in coming decades, or failing that, find its Chinese Lech Walesa to lead a Chinese labor movement friendly to “free markets” and bourgeois democracy. We must hope that both sides of this strategem fail, and that, unlike in 1917-1921 with Russia, the world working class will this time meet the Chinese working class at the rendez-vous. In scenes captured on a mobile phone, rioters overwhelmed and destroyed the police headquarters. And such disturbances are occurring more frequently, according to human rights groups. Two officials were sacked and several others were given verbal warnings yesterday for one of the worst outbreaks of unrest in southern Guangdong Province, the Guangzhou Daily reported today. The Party secretary and deputy Party secretary of Xintang Township in Zengcheng City have been removed from their posts after the unrest which erupted on June 10 in the export-oriented area, the report said. During the unrest, some people gathered around a police station, vandalizing vehicles and bank’s cash machines and attacking police officers in Xintang after a pregnant woman got involved in a dispute with local security personnel who asked her to move her stall from the front of a supermarket, according to previous media reports. The woman was a migrant worker from southwest China’s Sichuan Province who seeks a living in the town. A security guard involved in the dispute with the woman and her husband will be fired and detained by police for 10 days, the newspaper reported. Eleven suspects involved in the unrest have been charged by local procurators for obstruction of official affairs, causing a disturbance and intentional damage of property, according to the report. So, as part of giving an image of fairness on the part of the powers-that-be, the 11 arrests are “balanced” by the sackings of the 2 top bureaucrats. SIX people received jail terms yesterday from nine months to three years and a half for one of the worst outbreaks of unrest in southern Guangdong Province, the Guangzhou Daily reported today. Li Zhonghuang was sentenced to three years and six months in prison on the crime of creating disturbances. Li led a group of people on June 11 to destroy three police vehicles at the Xintang Township in Zengcheng City, causing damages worth 160,880 yuan (US$25,000), the report said, citing the local court. Yang Fajun and Ran Qinghua received a two-year jail term each for vandalizing vehicles on June 12 in Xintang. Ou Lin was sentenced to nine months while Kang Chuan got a term of two years and a half for destroying public facilities and vehicles on June 11. Zhao Jiu, who resisted arrest and hurt a policeman, was sentenced to two years in prison for obstruction of official affairs, according to the newspaper. Earlier media reports said that 11 suspects involved in the unrest have been charged by local procurators for obstruction of official affairs, causing a disturbance and intentional damage of property. The Party secretary and deputy Party secretary of Xintang Township have been removed from their posts after the unrest which erupted in the export-oriented area. During the unrest, some people gathered around a police station, damaging vehicles and bank’s cash machines and attacking police officers in Xintang after a pregnant woman got involved in a dispute with local security personnel who asked her to move her stall from the front of a supermarket, according to previous media reports. SHANGHAI (Reuters) – Eleven people have been jailed for their roles in riots that hit a city in the southern Chinese export hub of Guangdong province last month, state media said on Saturday. The riots in mid-June, which were sparked by the abuse of a pregnant migrant street hawker, flared over three days and saw rampaging mobs smash and burn government offices, pelt police with stones and bottles and overturn scores of vehicles. A court in the city of Zengcheng on Thursday sentenced five people to terms ranging from a year and a half to nearly six years, the official Xinhua news agency said…..
Other clashes have erupted in southern China in recent months, including in Chaozhou, where hundreds of migrant workers demanding payment of their wages at a ceramics factory attacked government buildings and set vehicles ablaze. China police station attack leaves several dead in Xinjiang. Further eruptions in China in Xinjiang, which the State is presenting as Muslim terrorism. There’s certainly an ethnic aspect to these riots – with some people calling for independence for the Uighurs, but even if there’s a standard nationalist-political dimension to them, there’s also clearly an independent anti-State aspect as well. The Chinese State is increasingly dependent on Xinjiang for oil, gas and coal to power the economy. BEIJING (Reuters) – Chinese police said 14 “rioters” were among 18 people killed in a clash at a police station in the restive Xinjiang region, a government website reported on Wednesday, an account that more closely reflected the tally reported by an exile Uighur group. Government officials previously said at least four people were killed in what they described as a terrorist attack but which the Germany-based exile group World Uyghur Congress said was an attack on peaceful protesters. The group had said 20 Uighurs were killed — 14 beaten to death and 6 shot dead — and 70 arrested, when police opened fire on protesters, leading to fighting between the two sides. The clash marked the worst violence in about a year in the far western region, home to many Uighurs, a Turkic-speaking people native to the area that is strategically significant because of its oil, gas and coal deposits. The Xinjiang government-run Website tianshannet.com said that police fatally shot the 14 rioters after giving “legal education and warnings,” adding that 18 rioters had bought and made weapons and sneaked into the desert city of Hotan days before the clash on Monday. The report said the rioters, armed with axes, knives, daggers, Molotov cocktails and explosive devices, “crazily beat, smashed and set on fire” the police station, and hung “flags of extreme religion” on the top of the station. It said two policemen and two hostages were also killed in the clash, and that four of the rioters were arrested. “It was an organized, premeditated and severe violent terrorist attack to local politics-and-law departments,” the report said. The differing accounts from the government and exile group could not be independently verified. the latest incident erupted after a group of Uighurs tried to seize a number of police officers as leverage in their demands for the release of family members detained previously. The attackers also set fire to the police station, located near the city’s bustling bazaar, reports said. The situation in Hotan, an ancient oasis trading post on the famed Silk Road, remained tense after the attack, with police sealing off roads in and out of the city and “large numbers” of anti-Chinese flyers circulating, Raxit said in an emailed statement. The flyers demanded the release of detained people, rejected the growing influence of the Han and called for independence, he said. Thanks for these continued updates! Crowd riots after death of vendorAnshun, Guizhou – The death of a vendor, who was believed to have been killed by urban management officers in Southwest China’s Guizhou province on Tuesday afternoon, caused a gathering of thousands of angry local residents. The unidentified vendor died in front of the gate of a market at Nanhua Lu, Xixiu district of Anshun city, at about 1:43 pm on Tuesday, which led to the gathering of the local people, according to a statement sent to China Daily from the publicity department of Anshun. The statement did not give details of the cause of the vendor’s death, only saying that “before the incident occurred, chengguan (urban management officers) were working in the area”. According to a video clip uploaded onto the youku.com website by an unidentified netizen, a vehicle with the sign “12319” on it, the local phone number of chengguan, was destroyed and turned over in the middle of the road. Many police officers were trying to break up the angry crowd. The footage also showed a man with a false leg, wearing a brown T-shirt and blue trousers, lying still on a pit cover on the roadside. He was surrounded by a large group of people. “They grabbed him and beat him,” said an onlooker in the footage. An eyewitness surnamed Jiang told China Daily that the vendor was a disabled fruit seller and people in the angry crowd claimed that “the murderer must be punished”. Armed officers were seen guarding the site to prevent the crowds from getting close to the destroyed vehicle, according to photos circulated on the micro-blog website of weibo.com. Local officials, including the city’s Party chief and the mayor, had arrived at the site and were guiding the work. The incident is still under investigation, according to the statement from Anshun publicity department. AT least 15 people died in a weekend of violence in Kashgar in northwest China’s Xinjiang Uygur Autonomous Region. Four suspected rioters were shot dead by police yesterday afternoon. Four others were caught, while police were hunting another four following a violent incident at 4:30pm yesterday in which three people were hacked to death and more than 10 pedestrians and police officers injured. On Saturday night at least seven people were killed by rioters in the city. Two suspects hijacked a truck at 11:45pm, fatally stabbing the driver and ramming into pedestrians. The pair later jumped out of the truck and hacked at bystanders. Six people were killed at the scene and 28 others were injured. One of the rioters died while fighting with local residents, the other was apprehended. Before the incident two explosions were heard. The first was at about 10:30pm from a minivan, the other at almost the same time from a food street where the men had hijacked the truck. In the aftermath of Saturday’s incident, Kashgar’s streets were almost deserted, and residents were still shaken by the tragic events. Yang said many people were gathered on the square outside her office when the suspects rushed into the throng and began attacking them. “Our security guards tried to save the residents while our manager attempted to subdue an attacker by holding him, but the man had a knife and stabbed him in his abdomen,” she said. The manager was taken to the hospital but later died. Li Fu was repairing motorcycles by the road when Saturday’s violence erupted. “I saw a blue truck speed through the crossing and plough into the crowd,” he said. At first Li thought it was an accident. Xinjiang, home to China’s Uygur minority, has long been under terrorist threat. Police shot 14 rioters who attacked a police station and killed four people in Xinjiang’s Hotan City on July 18. The attack left four people dead and at least four others injured. There was a major riot in Urumqi, the capital, on July 5, 2009, where rock-throwing and knife-wielding rioters looted shops, torched vehicles and killed nearly 200 people. In March 2008, five months before the Beijing Olympics, police arrested a 19-year-old Uygur for a terrorist attempt on a passenger flight. A tense calm appeared to hold over the weekend in the southern Chinese city of Lufeng, following days of riots over alleged government land grabs—unrest that reflected growing resentment over ties between Communist Party officials and property developers. The protests began Wednesday and continued Thursday, following complaints that land had been seized without compensation, a practice central authorities have struggled to stamp out in recent years. Land disputes have become one of the Communist Party’s greatest sources of instability. Local residents said more than 1,000 people took part in the protests, some of them smashing businesses and destroying police vehicles. More than 10 police were injured, as were several protesters, according to a government statement and local residents. The protests represent at least the second violent outburst in Guangdong in three months and reflect growing concerns across China over corruption, land-right abuses and a growing wealth gap, among other problems. Hundreds of migrant workers in June torched government buildings and overturned police vehicles in the city of Zengcheng, after security personnel pushed to the ground a pregnant migrant worker who had been working as a street vendor there. Similar unrest has appeared in some other parts of the country. The central province of Hubei experienced violent protests in June after the death of a local bureaucrat who objected to a land deal backed by higher-ranking officials. In May, a man in an apparent house-demolition dispute with local government officials in Jiangxi set off explosions at three government buildings, killing himself and two others. Central authorities have tried to standardize land-acquisition regulations. New regulations that came into effect earlier this year stipulate that compensation for homeowners should at least equal market value, as well as moving and other costs. Beijing has said local governments must adopt new central regulations by Oct. 1. Guangdong is home to millions from China’s migrant work force, who flock to the region’s Pearl River Delta in search of work. It has become an incubator for protests among the country’s poor, many of whom are increasingly conscious of legal rights and bold in challenging abuses by local authorities, analysts say.